On a cold and raw Tuesday in late February a hardy band of eight met at the Virginia Department of Forestry (VDOF) Buffalo Gap Work station near Churchville. Six trainees: Kelly Rourke, Janet James, Malcolm Cameron, Sue Eckroth, Ginny Hoffman and Janet Joseph joined two chapter members from the 2011 Charter class Jerry Hopkins and RoxAnna Theiss to get instruction on identifying trees in the wintertime from VDOF’s Patti Nylander. Patti had given similar instruction just about a year ago to our last Basic Training class. Although it was raw and breezy this year – last year the conditions were considerably tougher. Patti took the improved conditions opportunity to prepare a more detailed and leisurely instruction this year. 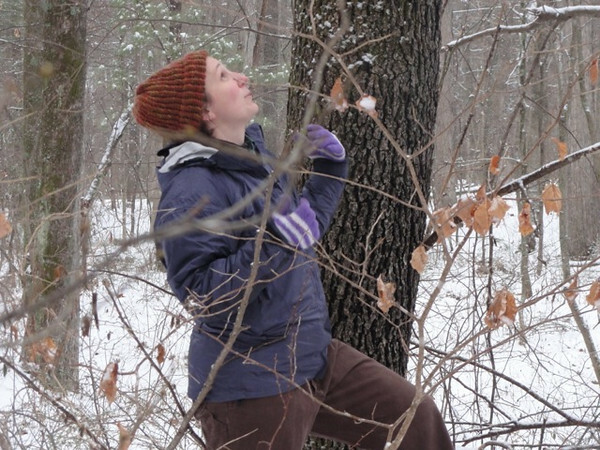 We started with some roadside lessons about the basics of tree structure: opposite branching patterns (Maples, Ashes, and Dogwoods – or MAD) and alternate branching patterns (everything else) and how it starts us down the winter tree ID path. Patti showed us the distinguishing characteristics between the two main Oak families: Red Oak and White Oak using the fallen leaves on the ground. Leaves from trees of the Red Oak family such as the Scarlet Oak, the Black Oak and the Pin Oak all have sharp needle-like points at the end of each leaf lobe. Conversely, trees from the White Oak family such as the White Oak, Chestnut Oak and Post Oak all have rounded and smooth edged lobes. There are also consistent differences in the acorn each Oak family produces. This was not an easy lesson to give as this past fall was a very poor year for acorn production all across the oak trees. We then moved into the woods where individual trees were discussed. Their value as timber, wildlife food and place in the forest canopy were outlined along with key bark attributes of texture, smell and taste. Yes, taste! The bark of those trees with high tannin content have a bitter sting on the tongue and often make livestock ill if they browse on the bark or branches. The Black Oak from the Red Oak family is one such tree with the added twist of having a bright orange cambium below the bark’s crust. One of the reason’s Patti likes using this site is the variety of trees represented here. 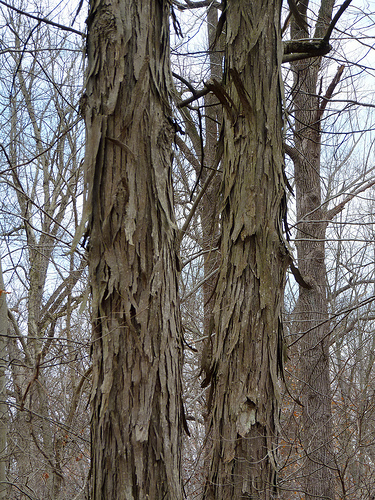 We visited her favorite tree: the Shagbark Hickory and learned of its value in sheltering bats and other small wildlife under its loose peeling bark. We experienced the wintergreen scent of the Black Birch and saw first hand the unusual 90 degree branching pattern of the Black Gum. Patti frequently quizzed us to see if the information was “sticking”. At the end of the lesson, Patti shared some history of the Virginia Department of Forestry that is celebrating its 100th year in 2014. Back in 1914 the infant agency had one full time employee and its sole mission was fire suppression. She tracked the agency’s growth through the twentieth century and outlined its expansion into forest management and work with private landowners. VDOF is currently partnering with the United States Forestry Service to manage and conserve Virginia’s diverse and significant woodlands. It was a grand day and a perfect cap to the field trip offerings for the fall session. Onto the Spring session with lots of exciting and unusual trips planned for the 2013-14 Basic Training class. March 5, 2014 in Field Trips.